Q: Which president is least guilty? A: Lincoln. He is in a cent. The penny pun has been cited in print since at least 2002. The “in a cent"/"innocent" joke has been printed on several images. The Lincoln cent (or sometimes called Lincoln penny) is a one-cent coin that has been struck by the United States Mint since 1909. The obverse or heads side was designed by Victor David Brenner, as was the original reverse. The coin has seen several reverse, or tails, designs and now bears one by Lyndall Bass depicting a Union shield. All coins struck by the United States government with a value of 1/100 of a dollar are called cents because the United States has always minted coins using decimals. Which president was least guilty? Lincoln. He is in a cent. Which president was least guilty? Lincoln. He is in a cent. Which american president was least guilty? Lincoln. He is in a cent. 9. Which American president was least guilty? 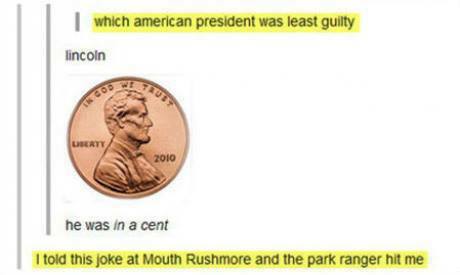 Lincoln – he was in a cent. What did the pirate say when he turned 80? Aye matey. posted on Feb. 11, 2016, at 2:00 p.m.